Did you know that dolphins can jump up to 6 meters in the air and their dorsal fin is like their fingerprint? In addition to being very friendly animals, dolphins are so amazing that they continue to amaze us with their skills. Swimming next to one is an exceptional opportunity and here are 19 reasons why you have to do it. The most important thing is that they are willing to give you their friendship and make you have a good time while you swim with them. Book a dolphin swim in Cancun or the location you want now. 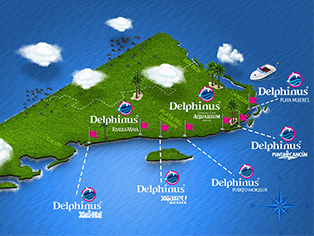 Delphinus has a great variety available to you.